It’s not compulsory for foreign children to attend school in China, so there are no legal obstacles to homeschooling. Many families will opt for homeschooling to save on costs, spend more time with family, and get the best out of their China experience by exploring the hutongs, museums, and other cultural heritage sites. Homeschooling can be tailored to any curriculum, belief system, or language. Homeschooling parents can collaborate to address socialization and sports needs through Beijing’s active homeschooling community, Beijing Homeschoolers (Yahoo group), which provides support, information, and opportunities to meet other families. Give your young children a head start learning the Mandarin language through the “Miao Mi” channel on Amazon Prime Channels! Designed for kids aged 3-6, Miao Mi is a Mandarin edutainment VOD service that features award-winning, parent-approved, shows enjoyed by millions of kids across Asia and is now available in the U.S. Although to date there has no accurate statistics of home schoolers in China, the increasing reports of the cases in the media suggest the number is growing. Most parents who home school their children make the decision because they do not believe their children can learn what they really need in school. [Note: not one problem is discussed!] China View. The Shanghai group, interestingly, was not Christian. Instead, parents involved in this network were eager for their children to absorb Confucian values. Beijing’s rising cost of education has driven many international families to homeschooling their children. We recently examined this trend and The Global Times has also run at an article looking at a few families in the capital who have made this move. Without tuition fees or text books, a group of boys and girls 9 to 18 years of age study together at Catherine Lamb’s house in Shanghai. China Daily. Homeschooling has become a popular option in Beijing as tuition prices continue to rise at international schools. Homeschooling offers flexibility and the freedom to learn what you and your kids are passionate about. “When we came to Beijing we didn’t want to put her in a public school right away, because she didn’t know any Chinese. The only other option seemed to be a private school, which wasn’t going to happen on our budget,” says Kitchens, a part-time teacher from Arkansas, US, who scrambled for other educational options upon arrival in Beijing. Expat Forum discussion about homeschooling in China. We are relocating with our 6(!!!) kids from the US to HK in april 06. We currently Homeschool and are planning on continuing there. GeoExpat Forum. For new people, after you apply, you will receive a Private Message from one of the Admins, please check your ‘Others Folder’. Once your membership is approved, please post an introduction to the group. This can help us to detect spammers. Thank you very much! For anyone who is interested in Homeschooling, Unschooling in Hong Kong 香港自家教育. 歡迎大家交流吓…. Each month I get between one and three emails asking me questions about living and homeschooling in China. Mostly these messages are from moms whose husbands are moving to China to work. They ask me about homeschooling — is it legal in China and how do you get homeschool materials? Another frequent issue is learning language — how did you and your daughter learn Chinese? Primarily answers questions about being an expat living in China and homeschooling. It’s not compulsory for foreign children to attend school in China, so there are no legal obstacles to homeschooling. Many families will opt for homeschooling to save on costs, spend more time with family, and get the best out of their China experience by exploring the hutongs, museums, and other cultural heritage sites. Homeschooling can be tailored to any curriculum, belief system, or language. Homeschooling parents can collaborate to address socialization and sports needs. Jennifer Ambrose relocated to China from the US in 2006. A columnist for beijingkids, she has two children with her husband Randy: 10-year-old Myles and 5-year-old Brigid. She homeschools both of her children at the family home in Changping outside North Sixth Ring Road. The literature in relation to home schooling grounded in empirical research and focusing on gender role and the impacts of social class has been neglected and unexplored. Home schooling is at an initial period, for the public, researchers, media and educational authorities in China it is mysterious and even abnormal or odd. This book seeks to bring a rich body of qualitative data to provide in-depth information in relation to the demographic characteristics of home schooling parents, the motivations for home schooling in China, the process of practicing it and its relevant academic and social outcomes. Learning with Mothers examines the social difference in terms of social class in the process of home schooling and also takes account of gender difference in terms of parental involvement, aiming to answer the questions about home schooling, such as: ● Who are practicing home schooling for their children? ● Why do parents choose to home school their children? ● How are parents involved in their home schooling? ● What is accomplished in doing so? This book is the first book in relation to home schooling in China. This book will be essential reading for researchers, postgraduate students and Chinese parents with in-depth information in relation to summary of updated literature on home schooling in China. Unhappy with the rigid teaching style of traditional schools and recent student abuse scandals, some tiger moms in China are keeping their kids at home. Wall Street Journal. Summary: In early 2014 I reviewed a fascinating article by Xiaoming Sheng about “Meng Mu Tang,” an education cooperative operated by a Confucian Chinese mother that began as a home school for her own children and eventually expanded to twelve children in the city of Shanghai. 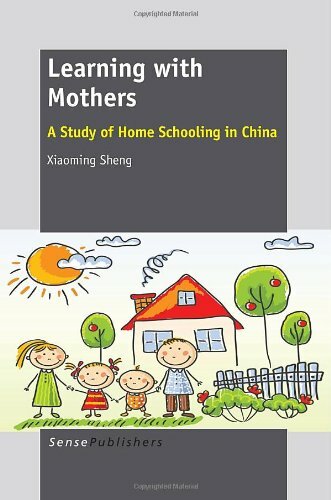 This present study builds on Sheng’s work and offers an empirical study of this mother and four other home educating families in China. Posted on January 31, 2015 by Milton Gaither. This group is intended to be a support network for families here in Beijing who are homeschooling their child(ren) for whatever reason. This discussion list is inclusive, which means we respect your choice of religion or none at all. Members must be living in Beijing (or moving here shortly) and homeschooling their children (or planning to after arrival in Beijing). Email [email protected] and explain a bit about your homeschool plans so Julie knows you are serious, and she’ll allow you to join. This group was created by the Beijing West side Homeschool Co-op for the purposes of communication, encouragement and support for parents involved in the Co-op. It was not easy to find home(un)schooling families in China on FB, so I created this group in order to know more friends and let us talk freely here. SHARE is a Pudong based support group for homeschooling families living in Shanghai with members living in all parts of Shanghai. This yahoo group was set up to facilitate information for the group. Please help me build this section! If you’d like to get more to join your homeschool group in China, and feel safe to do so, please add your group’s link and description to the comment area below. Be sure to include your city and province. Do not include any personal information.